The ObamaCare Watch (OCW) project was right up our alley! The people at the Galen Institute understood that they weren't just asking for a re-design, they wanted a re-engineering of their web presence. We took the vast content from the old website and professionally coded a new website based on the client's needs. Overly Simple Website Operation: The people working on the day-to-day content are extremely busy, but adding to the website multiple times a day is a must. So, as GWD built this site we focused on making things very easy for non-technicals to manage this site. Custom Post Interface: If you look at a post page for OCW, you will see that there are some custom data points (author, publisher, and link to original article). Instead of making the user build out this in a sidebar for each article, we added custom fields to the "article" custom post type. This allows them to select the publication from a drop down, with logos automatically set, then they just cut and paste in the author/link. This simple yet effective update saves them a couple minutes each post, which is huge since they have over 5,800 articles (as of March 2017). Custom Plug-in for Featured Articles: It was imperative that OCW had total control and easy access to edit the featured articles. So, to make sure we delivered perfectly, we build our own plug-in for their featured articles. We are web development nerds at GWD, so we love the backend ease of use much more than the front-end look. Check out the screenshot below, it is a simple drop down to select which article you want to feature. The image and title is automatically pulled from the article, then they even have access to change the color of the shade on each article. 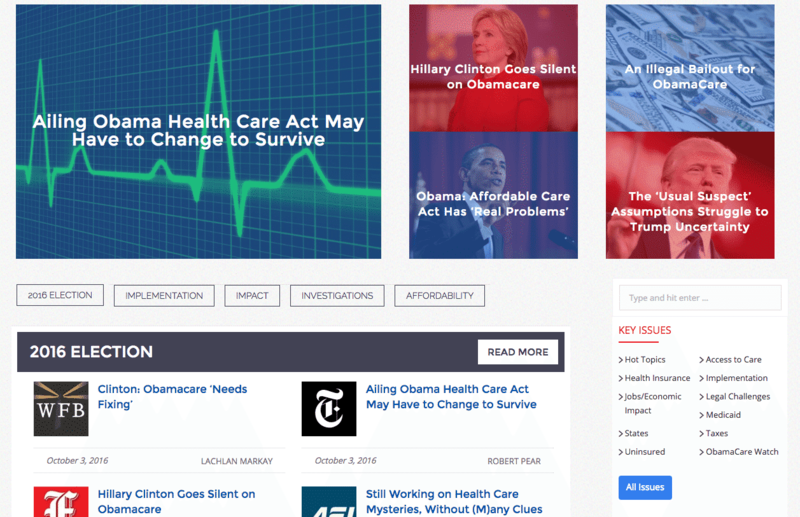 This is cool because they usually shade articles red or blue based on a democratic or republican view! 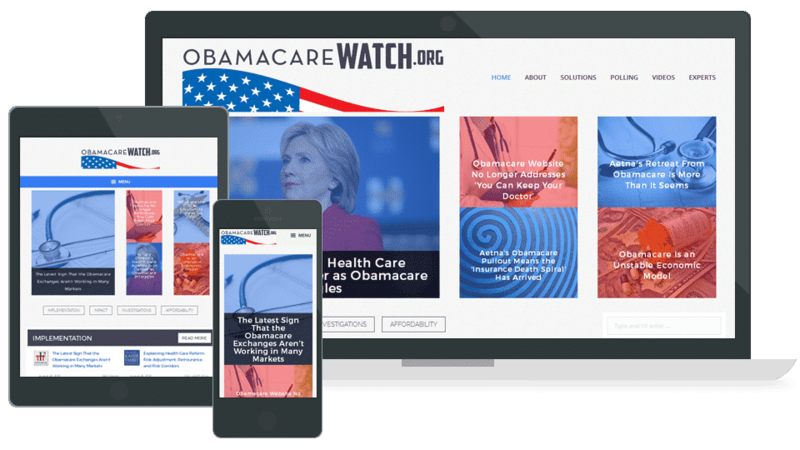 The original ObamaCare Watch website was built in Joomla. By September of 2015, it was an un-updateable technological mess. But, it had a library of great content that was added to it over the years, so we had to extract all that data and port it over to the new WordPress website Grover Web Design was building. This was an extremely important step and there are a few key elements that we did to make the migration successful. First off, obviously, make sure all data, images, and categories are preserved. Then, we made sure to harness all the search engine power that the site had built up over the years. All of the old ugly style URLs were set up with 301 redirects to forward to the new pretty URL structure that we had built. Lastly, we took a loosely structured content hierarchy and added some nerdy organization to make sure the content flow was clear and easy to manage. Check out the homepage, we have our top "featured" articles and then the main content section shows off the first 4 articles from our most important categories. On the right sidebar, you will see a larger set of "important" categories. Finally, click "All Issues" to see all the categories. We manage the Google Adwords and Facebook marketing campaigns for ObamaCareWatch.org. Attacking a marketing project for a website is a hybrid between creativity and technology. If you only have "creative" then you will end up with beautiful ads with slick words, but end up paying too much for your ad buys and not get the exposure you need. If you only have the "technology" side, then you will have great exposure, but an ugly message. You decide which is worse! Our method to just have both skill sets. Our results show that we may be right. 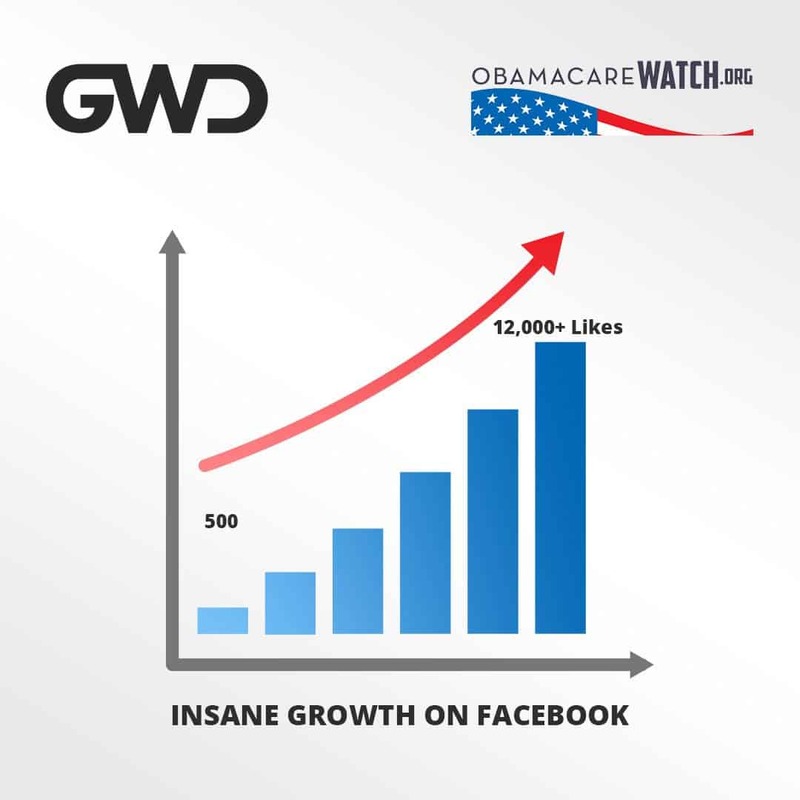 ObamaCareWatch has continually increased page views and over the past year has gone from 500 to 12,000+ followers on Facebook! GWD did a wonderful job on the ObamaCare Watch website re-build! Thank you so much. We can tell you got really invested in doing this project right, and we are most grateful. The site looks terrific and is so much more user and operator friendly.